43, 44,45-46, 47, 48-49, 50-51, 52-53. A slim week for contributions with just two submitted and scored. The downturn in the price of STEEM again a likely factor following a recent resurgence in contribution numbers that also coincided with a lift in the price of the token. Sadly, one of the contributions was hit with a raft of spam comments which don't look great, but are seemingly unrelated to the submission itself. Both contributions this week were by 'lostmine27', who continues to supply analyses on various topics. His first is a detailed look at the movement of STEEM via a couple of notable Steem accounts to the exchanges. The analyst notes that 8.8 million STEEM was transferred in one go on January 21st, and concludes that the recent upswing in price was likely due to this trading activity. It seems that the analyst is worth following if trading STEEM is something the reader is interested in - they bought and sold for profit during the recent price movements. The second analysis also looks at fund transfers, but this time it is internal to the Steem ecosystem and is related to the 'Promotion' feature within the Steemit.com interface. From one of the charts included in the report, it is easy to see the waning interest in this feature over the past year. 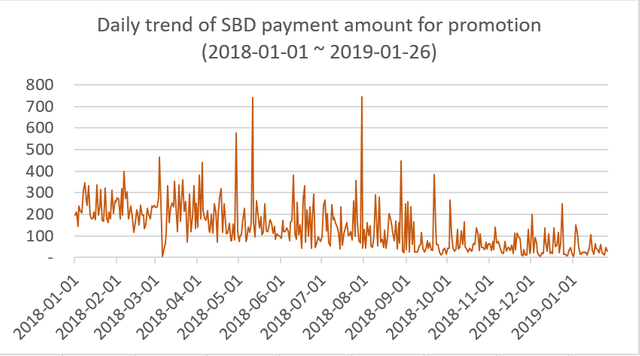 It would be interesting to see on the graphs when the delegation fork arrived, and when each of the major bid-bots showed up, to see if there was any correlation between their introduction and the decline in use. Overall, the analyses perhaps lacked in scope (1) and the potential of further insight (2). The aim of this section is to represent the current weeks activity along with a recent set of data. The current data span covers the previous 18 weeks. An average score of 54 this week is 16% lower than the 18 week average of 70.21. 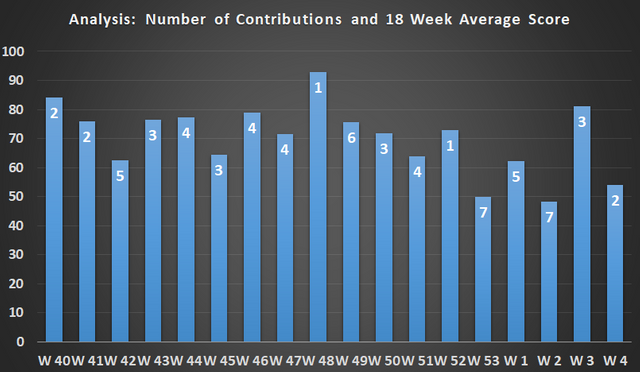 Two contributions brings the average 18 week average total to 3.67 per week. No new contributors since the last update. 'paulag' tops contributor table with 16 contributions at an average score of 74 over the past 18 weeks. 'lostmine27' is in a clear second place with 12 contributions and an average score of 65. 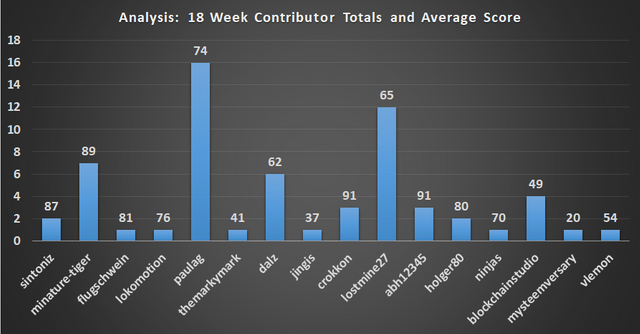 9 contributors have an average contribution score of 70 or above over the past 18 weeks. 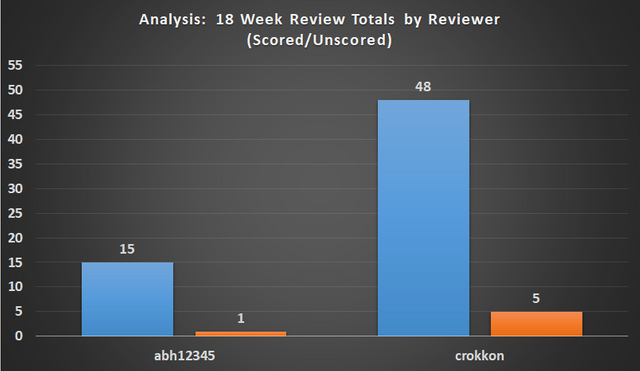 Two reviewers assessed all 63 contributions that received a score in the past 18 weeks. Six contributions have not been scored during this period. 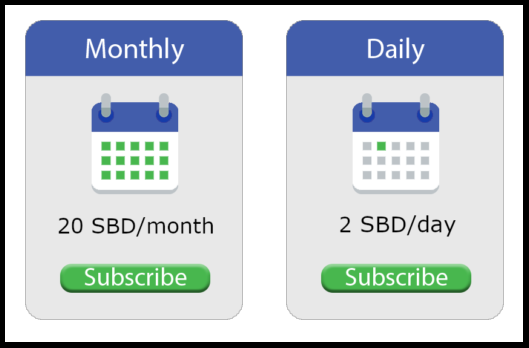 In recent days, the cost of accessing a copy of the Steem blockchain data via SteemSQL has increased. The Analysis team is available for contact in the utopian-io discord, and also via our blogs. We would like to be able to give every contribution the opportunity to be scored and welcome conversation from potential, or existing contributors that have an idea of a piece of work they are thinking about submitting. That's all for this week, thank you for your time. 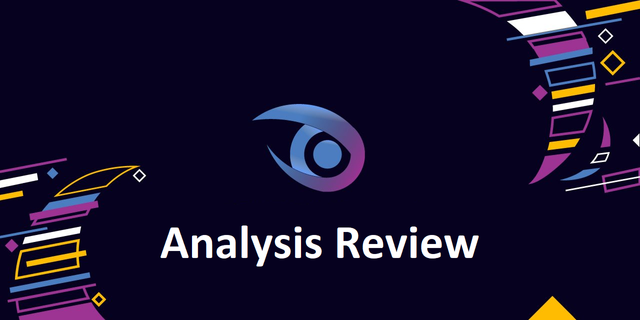 Thanks for providing this comprehensive overview of the Analysis category. It is another calm week with fewer contributions compared to the previous week. However, I am glad that the category continues to be among the active categories. About the increment in the subscription for SteemSQL, I think the price worth it. Considering the current value of SBD and the factors he explained in the post. I just hope this will not have a negative effect on our contributors. A bit too quiet at present for my liking, and so I've tried to add other details to the Post to give some 'news' on Analysis. I'm hoping that in the next few months, the 'winter' will end and we will see some growth. 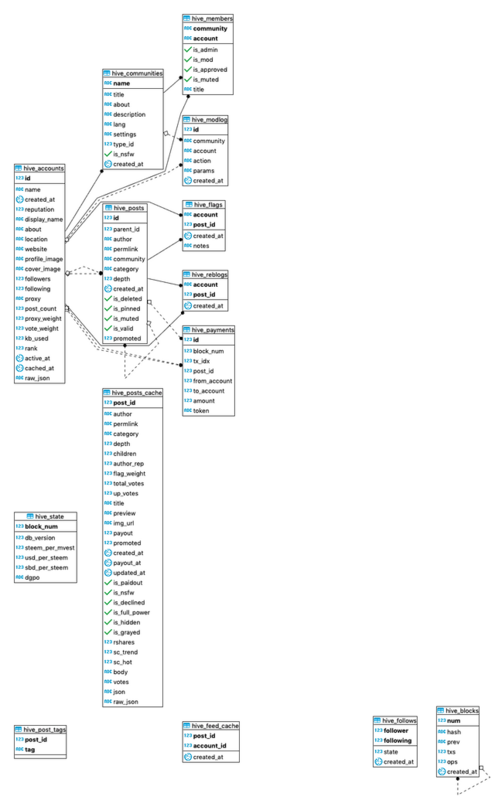 Your contribution is very useful, and here everything looks. Pikachu likes a bit of analysis, I'm desperate to know how everything looks though! What's on the menu for Friday boom, any deaths or beverages today? Today, is wine Friday with the missus but I don't worry about that :0) tomorrow is magic beer tastic!! I haven't quite decided which ones though! I'm thinking of rounding up the sofa change and grabbing a couple to entertain me. Your UA account score is currently 6.849 which ranks you at #104 across all Steem accounts. In our last Algorithmic Curation Round, consisting of 281 contributions, your post is ranked at #104. I upvoted your contribution because to my mind your post is at least 16 SBD worth and should receive 226 votes. It's now up to the lovely Steemit community to make this come true. Wouldn't it be nice to have 4-5 good contributions a day? I wonder what it would take to garner that kind of action? That is a lot! Even during the early boom and peak times for utopian, i'm pretty sure the Analysis category didn't hit 28/30 for the week. For a good while though between November 2017-March 2018 we would be comfortably in double figures. I'd be happy with that, and I guess from the above it seems that the reward for producing content that can often take a day (for me anyway) does need to go up to spark renewed interest. It has been a while since my analysis was written. Below is a side comment. Downvote terror was irrelevant to the content of my article. Since an account with a very small SP downvote my post, I also downvote that account, then bernie's bots came and went to terror. It is my carelessness not to warn me not to do unrighteous downvotes, but I think Bernie's offensive terrorism is very wrong. You will know about Bernie's attitude. I have never been downvoted while blogging for over a year. The unjustified and one-sided downvote terrorism is one of the oldest and biggest disadvantages of STEEM. Apart from the problem of scaling down the rewards, this act of Bernie was a minor scar on me. haejin and bernie are steemians I hate, but bernie is particularly messy. In some of my analytical articles, there are many comments in separate Korean versions. Usually 2 ~ 3 times more comments than English version. I started the activity in the global unit late, so please take this into consideration. I know that you contribute to the community in various ways. So I already voted steemcommunity as a witness.